Every Eliet overseeder machine is equipped as standard with Permanently Sharp Blades™. The blades are selfsharpening, thanks to ELIET’s revolutionary concept, so that they retain their sharp cutting edge during their entire working life. Because these knives always stay sharp you can keep on using them until they are completely worn down. Our unique ELIET knives have a 100-hour knife life. On this ELIET machine, the heavy work is performed by the 57 reel blades underneath the machine. Especially hardened blades cut slits underneath the lawn at 10-15 mm spacings. 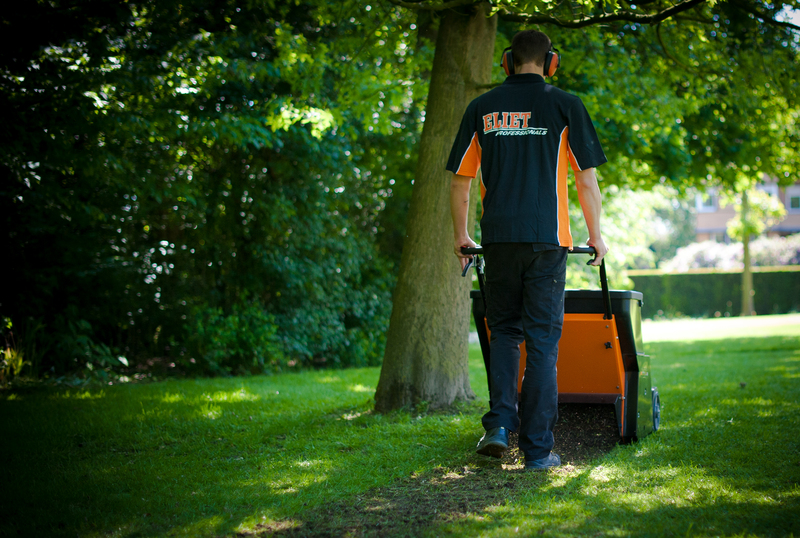 The blades rotate in reverse so that the soil, thatch, moss and grass are lifted from the lawn. This method guarantees cleaner slits that are more suitable for receiving and retaining the grass seed. The ideal blade thickness for overseeding is 3 mm. The rejuvenation of a lawn is easy to quantify, the travel speed is constant thanks to the powered wheels and the seed flow can be precisely set. The rejuvenating effect of overseeding treatment can be seen within 14 days provided rainfall is sufficient. 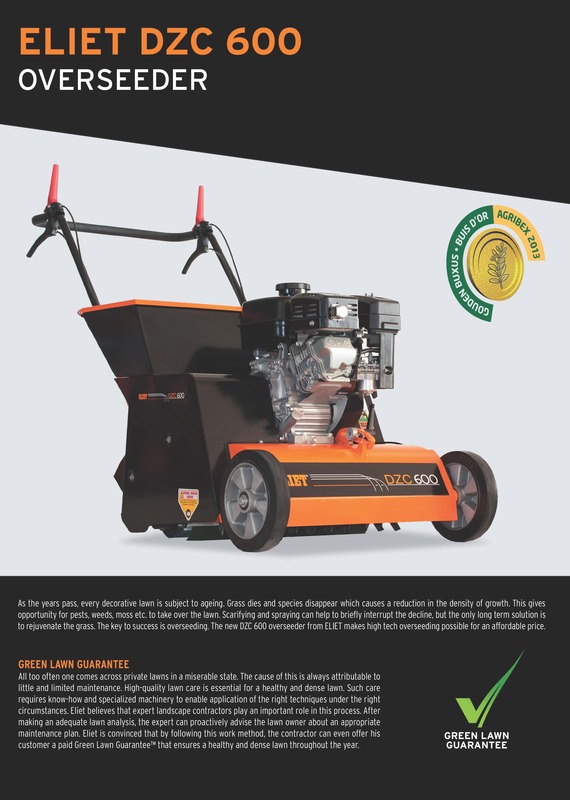 In addition, the DZC 600 can be used as a scarifier, which further increases its versatility. Overseeding is a very efficient method for treating lawns. Work can begin after clearing up following an intensive aeration process. The DZC 600 is very easy to operate. Although the overseeder has a working width of 600mm (23.6"), it remains very compact in size and easy to operate thanks to its powered roller. 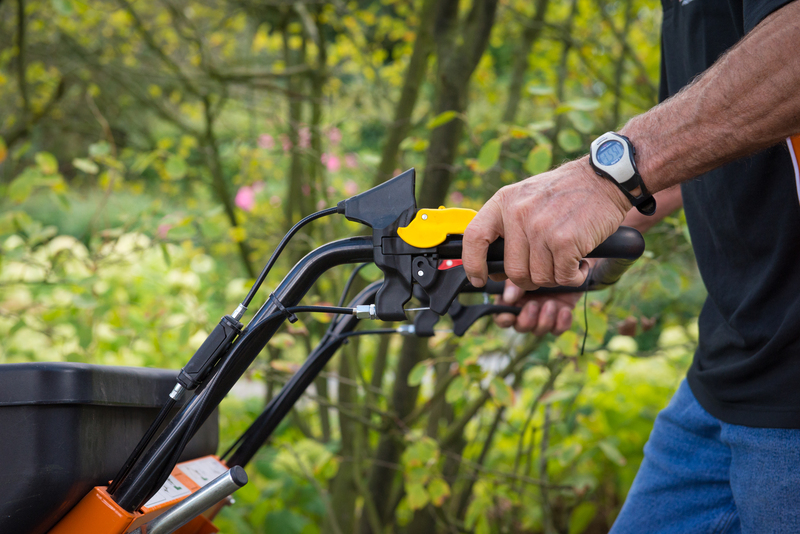 All operating controls are mounted on the handlebars, such as blade engagement, drive controls, seed distribution switches, lowering to working depth etc.